Another exciting DVD release has been announced by Network! 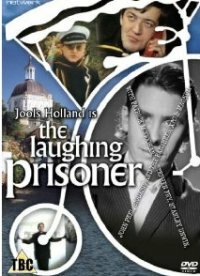 In 1987, the popular Channel 4 music show "The Tube" (presented by Paula Yates and Jools Holland) produced a "Prisoner" special, set in Portmeirion entitled "The Laughing Prisoner". Finally after 25 years the 50-minute episode is receiving a DVD release. Starring Holland, Stephen Fry, Stanley Unwin, and featuring clips of Patrick McGoohan from "The Prisoner", the plot revolves around Holland resiging from Channel 4 and being upducted, Prisoner-style, into the village where only he and the above named people are residents. Featuring musical performances from the groups Magnum, XTC, and Siouxsie and the Banshees, the special has good jokes, music, and footage of Portmeirion and is released later in 2012. Priced it seems at only £4, it can be pre-ordered by typing "laughing prisoner" into the search box on TUW's Amazon page HERE. With thanks to Geoff Lake, Alex Lydiate, SR, Helen Weathers, and Elliot Pavelin for this news item.